1generalstore has no other items for sale. Work on projects with enhanced efficiency when you use this DeWalt brushless hammer drill and impact driver. This kit uses a 20-volt maximum lithium-ion battery. The base charging station features a light emitting diode indicator so that you know when your tool is fully charged. Both tools also have light-emitting diodes to illuminate the work area. California Prop 65 Warning This product can expose you to Lead, which is known to the State of California to cause Cancer and Birth Defect/Reproductive Harm. For more information go to www.P65Warnings.ca.gov. Immediate payment of US $267.00 is required. Thank you for your bid! Insurance is optional, we cannot be held responsible for the actions of the Post Office. PAYMENT BY PAYPAL ONLY. International buyers are responsible for any possible customs fees. We do not personally warranty any of the tools we sell. If you have an issue with any of your tools please contact your local dealer. 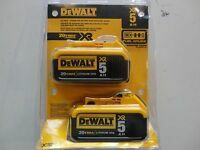 Dewalt's Best Tools On The Market! This is the way to get the job done!. Plenty of power! This tool kit, with the drill and impact driver two 5ah batteries, makes any job requiring these tools go smoothly and quickly. I have several of these type tools that are not brushless. I always reach for these brushless tools in their case. Convenient, powerful and useful! What is not to love about these tools! Get you some! Great Product, great combo kit, much cheaper than home depot. Great product, would recommend. hammer drill is high quality, impact driver is the best little tool I've used in a long time. 5.0Ah batteries hold their charge a long time, with little need for recharging during the day. I own a Dewalt 9.6V drill/driver (DW944) circa 1993. I still have it and it still works great. Bought the 20V MAX XR as I have a need for a hammer drill and impact drill. I also wanted to get into the new Lithium-Ion batteries. This kit fit the bill and it was priced right. I've only had the drills for a week now and so far everything is as I expected from Dewalt. Charged the batteries and I'm good to go. Things I like - feels right in my hand - lightweight - lights - quality - power. So far, there's nothing I don't like about these drills. Best cordless set I have ever owned. Love the brushless motors. The drill can twist your wrist as good as any corded drill. Good solid metal keyless chuck. The 1/4" impact with the adjustable torque is really good also. I also like the LED lights that come on when you squeeze the trigger. They have come in handy plenty of times so far.